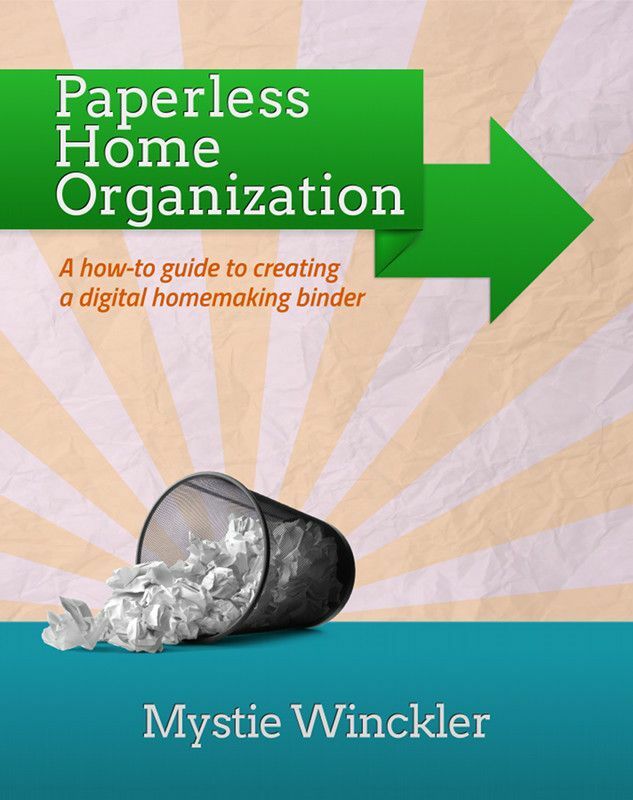 I am going to focus on Paperless Home Organization, a 75-page eBook by Mystie Winckler, because I need it! 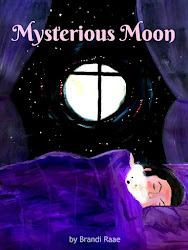 Reading Mystie Winckler's e-book really inspired me to begin using my smartphone to its full potential. I'm taking baby steps, but I am on my way to making a lifestyle change in the area of paperless organization. To begin, Mystie shares about the benefits of a having a home management binder and the benefits of going paperless. Also right off the bat, she declares that it's best to keep things SIMPLE. I like that. Instead of having a bazillion apps, she uses 3 free online tools and their corresponding apps to manage everything: Evernote, Remember the Milk, and Google (mail and calendar). These specific applications don't force you to use a certain type of structure. Instead, they act like blank canvases allowing you to tailor them to fit your own needs. After explaining that her methods are based upon the concepts in David Allen's bestseller, Getting Things Done, she walks you through the process of setting up the 3 accounts mentioned above: Evernote, Remember the Milk, and Google. It was completely painless to set up all the accounts! Evernote is what Mystie calls "the meat of the system." It's the digital replacement for all of your notebooks, filing cabinets, binders, etc. Most of your information will be stored here and best of all -- it's searchable! Because Evernote is a daily used source that will be referenced throughout the day, she spends quite a bit of time discussing the principles of Evernote, how to use it, and how to get things done with it. She also explains how to use it as a filing cabinet and gives a list of examples of material you might want to digitally file. Mystie uses Evernote to manage all of her information regarding homemaking, housekeeping, and homeschooling as well. She includes sample notes and structures for all of these. If you are a Blogger, you can even use it to brainstorm and draft posts. Remember the Milk is a task management program that basically serves as an online to-do list. To keep from overwhelming you, Mystie gives step-by-step instructions on set-up and use. She explains principles for keeping Remember the Milk simple, consistent, and useful and shares many valuable tips and tricks. Google is the program Mystie uses for her email and calendar. All of her email management instructions will be specific to Gmail, so if you use a different mail application, she suggests creating a Gmail account and forwarding all of your mail to your new account. First, she explains how to forward notes directly to Evernote. Next, she shows you how to set up labels and create filters to manage your inbox, and for optimal Gmail performance, she recommends choosing several specific settings. She continues with Gmail principles, tips, and tricks which will help you manage all of your information simply and effectively. Google calendar is a feature that is essential to staying organized. Having an online calendar makes it easier to add repeating events. Plus, if you need to change something, you don't have to erase and rewrite! Again, Mystie walks you through set up and shares lots of principles, tips, and tricks to help you keep your calendar current, consistent, and effective. At the end of her book, she gives advice on how to keep everything running with daily and weekly reviews. As I began reading this eBook and setting up the recommended web accounts, I called my husband over to ask him a question about something I was working on. He gave me that why-are-you-doing-this look. Basically, he told me that it would be more beneficial for me to just use what we already had. We use Outlook, and there's already a calendar and a tool called, OneNote, which I am assuming is similar to Evernote. Those 2 apps were already on my phone. Go figure. I told you I was clueless! I decided to keep using Outlook for my email and to start using it for my calendar and list-making. (And this was already after I had typed everything for this month and next month in the Google calendar. Oh, well.) I made a couple of goals for myself to get me started on the paperless venture: 1.) 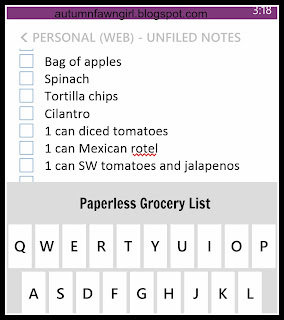 start keeping a grocery list with OneNote, and 2.) start using my Outlook calendar instead of my wall one. 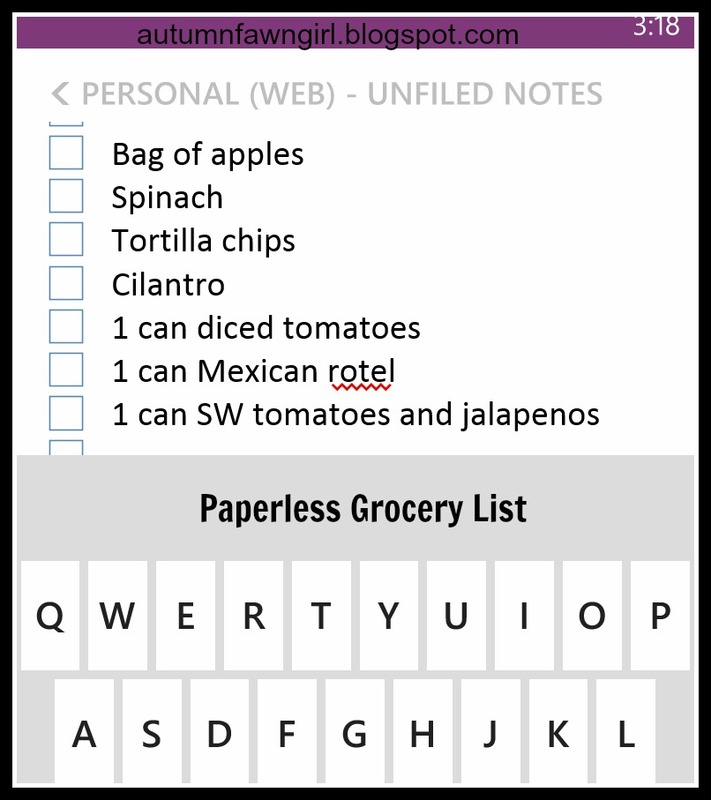 I am happy to report that for the past month I have completely ditched the paper grocery list for a paperless one! Now that I've done it, I realize how much easier it is to make the list! Wow, it's definitely easier to add items in as I think of more things, it's a lot neater, and it's so easy to check items off as I shop at the store. I am also happy to report that I have met my other goal. I've been very consistent with using my paperless calendar, and I am finding that it really is easier than using my wall one. Getting reminders on my phone is great, too. My wall calendar never did that! Also, I've been using OneNote to keep other lists besides the grocery list. I am keeping several lists on there now: Books I Want to Read, Read Alouds 2013, Blog Post Ideas, Homeschool Supplies Fall 2013, Quotes, etc. Seriously, all of these kinds of things used to be written on paper whenever and wherever! Thank you Mystie for inspiring me to stop using so much paper and to start getting it all organized! I am not sure yet whether or not Remember the Milk is going to work for me. I don't keep a home binder/daily to-do list at present, so I feel like it's a lot of extra work for me to start a digital one. I might look into it more once this last week of homeschool is over. :) It's still a little overwhelming for me to be making such a drastic change. Overall, this eBook was very helpful and inspirational. It's clearly presented and extremely thorough. If you are trying to go paperless and need help organizing everything, I think Paperless Home Organization will help you do just that! 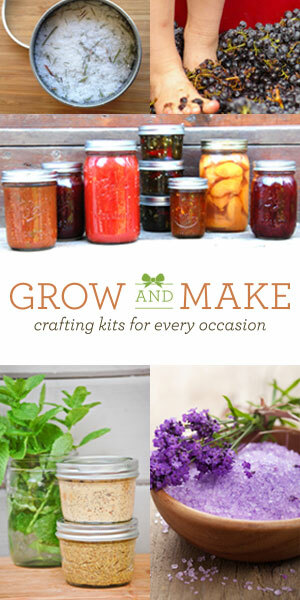 *Special Offer: Mystie is offering a 30% discount on all of her eBooks from May 20 - June 3! 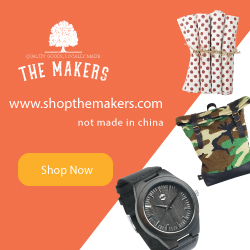 Enter TOS2013 during checkout. To find out more about this homeschooling mom of 5, visit Mystie's blog, Simply Convivial.